Too early to start thinking about the 2020 California Primary Election? At sf.citi, we think not. We’ve made it our mission to keep our members and community informed about elections in San Francisco, such as the one coming up in November 2019, and the state at large. We sat down with California Secretary of State Alex Padilla to discuss how voting for the 2020 Presidential Primary Election in California will look different than in years past, as well as the topic du jour: election security. First, a little Secretary of State 101. Dubbed the Chief Elections Officer, the California Secretary of State oversees the state’s electoral processes, including voter registration and disclosure of campaign finances. The Secretary of State is also in charge of managing the state archives and registering and authenticating California businesses. In fact, the Business Programs Division is the largest branch of the Secretary of State. Secretary Padilla was first elected Secretary of State in November 2014 and then re-elected in November 2018. 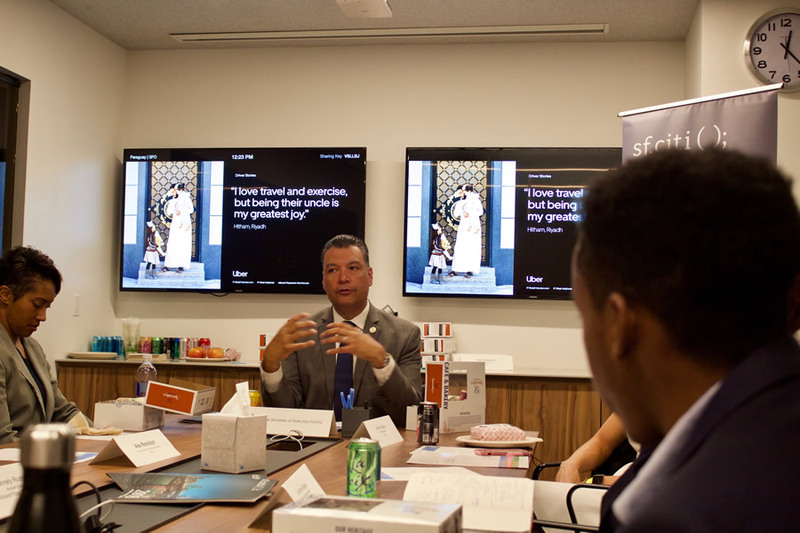 As a part of our Election Roundtable, sf.citi had the privilege of hosting Secretary Padilla, California’s go-to authority on elections, earlier this April at member company Uber. Take a look at what we learned below. Historically, presidential primaries in California have been some of the last in the country to take place, meaning presidential nominees are more or less determined by the time they make the rounds in the Golden State. According to Secretary Padilla, moving the California election up in the primary schedule will force candidates to “address our issues and earn our support,” not just roll through for campaign donations. Secretary Padilla championed Governor Brown’s 2015 New Motor Voter Act, which made California the second state (after Oregon) to adopt automatic voter registration. The law went into effect in April 2018, which means Californians no longer have to fill out a voter registration form. Instead, eligible Californians are automatically registered to vote during their routine visits to the DMV to obtain or renew their driver’s license (they can, of course, opt out). High standards. Updated in 2015, the California Voting System Standards established stricter requirements for voting systems than even the federal government. Fifty-eight counties have purchased new voting systems in order to meet the new standards. Secretary Padilla, meanwhile, secured $134.3 million to help counties upgrade or replace voting equipment, some of which is so old that manufacturers no longer make replacement parts. Social media savvy. The Secretary of State hired additional staff and invested in social media software to flag erroneous voting information across major social media channels (read: Facebook, Twitter, YouTube). These companies can then decide whether or not to take down the flagged content. Furthermore, the Secretary of State has invested in social media advertising as part of its VoteSure campaign, to more proactively distribute “reliable, trusted official information” to voters. Post-election audit. As the last protection against election tampering, the Secretary of State ensures that all counties conduct a post-election audit. California is one of 34 states, in addition to Washington, D.C., to carry out a post-election audit. Five counties in California (Madera, Napa, Nevada, Sacramento, San Mateo) adopted the Voter’s Choice Act for the November 2018 elections. The Voter’s Choice Act makes it easier for people to cast and return their ballots. Residents of the participating counties receive their mail-in ballot 28 days ahead of the election and can return it to one of the many ballot drop-off locations. The Voter’s Choice Act also streamlines the in-person voting experience as residents can vote at any voting center in their county rather than the one closest to home. According to Secretary Padilla, voter turnout in each of the counties conducting elections under the Voter’s Choice Act exceeded statewide turnout. Several more counties (Fresno, Los Angeles, Mariposa, Orange) are adopting the act for next year. Have we convinced you of how easy it is to vote in California? Register here. From improving voter systems to easing the registration process, modern technology has proved critical to driving up civic participation and engagement. But that’s not the only place for tech during election cycles, emphasizes Secretary Padilla. While many San Francisco tech companies and sf.citi members already find creative ways to get out the vote come election time, Secretary Padilla calls on all tech companies to join him as “Democracy at Work” partners. The tech community has a very broad reach, and not just an opportunity, but I suggest a responsibility, to help inform the general public about civic participation. In true sf.citi fashion, we will keep you up-to-date on everything #Election2019 and #Election2020. What you can do in the meantime, is start brainstorming how you and your company will raise awareness about the next San Francisco election in November 2019 and, of course, the 2020 Presidential Primary Election in California. Tell us what you are doing to prepare for 2020 by dropping a line at info@sfciti.org or tagging us on Twitter.